When it comes to a truly one-of-a-kind piece of furniture, imbued with passion and artistry, there is no better place to look than Glyn Peter Machin. “This is a place where new luxury is made, where new levels of superior design, craftsmanship and detailing define every piece of bespoke interior furniture or accessory. We consider every item to be a work or art,” says Machin. For more than 20 years Glyn Peter Machin and his dedicated team have combined the finest woods, veneers, precious metals and other traditional materials with advanced technological finishes and modern composites, creating bespoke luxury interior furniture, as well as exterior furniture and artisan-inspired accessories. The respected manufacturer’s exclusive collections and significant individual pieces can be found in superyachts and private homes around the world. Each design evokes a visual artistry while placing emphasis on the importance of detailing. 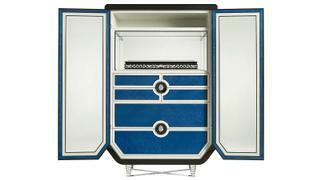 Take the Serengeti Plains cabinet, which features hand-painted doors depicting the African landscape at dawn. The door panels are trimmed in gold and housed in a solid African wenge frame, the handle trims and solid wenge legs are also fitted with gold detailing, and the cabinet has a 20mm thick custom art glass top. This beautiful piece can be made bespoke, with any design applied to its doors. Another stand-out piece is the TYC224 dining chair, presented in high-gloss macassar ebony with high-gloss white lacquer. Within the Glyn Peter Machin accessories line, there are the likes of the ivory white and gold leaf Adorn lamp, the trio of black, clear crystal and gold leaf Adorn vases and the Adorn Navigator, presented in rose gold and ebonised ripple sycamore; the latter, a very special collector’s piece, is custom made to house a pair Steiner Commander Global marine binoculars. Fully bespoke versions are available for all Glyn Peter Machin’s furniture and accessories. The current focus for Glyn Peter Machin is a new accessories line, featuring limited edition and bespoke pieces, encompassing traditional crafts and artisanal skills from around the world. 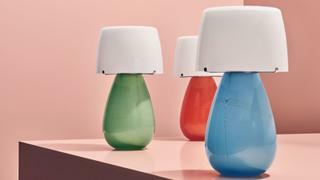 These include a series of vividly rich coloured glass lamps, which merge Scandinavian simplicity of form with the centuries-old glass-blowing techniques of Murano, Venice. Each piece encompasses thick layers of clear crystal infused with gold leaf, over layers of colour. As well as the lamps, there is a series of different sized vessels, vases and bowls, forged using the same process, and a collection of 30mm thick hand-cut crystal vases. There is also a selection of decorative jewellery and writing boxes that take inspiration from gemstones, are hand-painted or have over 4,000 pieces of deep colour-dyed marquetry. Each unique design or object created by Glyn Peter Machin is born from the foundation of six pillars – functional precision, personalisation, exquisite detailing, material splendour, artisan mastery and objects of beauty. These covetable individual or collective works of art are designed and created in Glyn Peter Machin’s central Copenhagen studio. Located in a restored and historically protected 190-year-old boathouse, it’s undoubtedly an inspiring place to work, as well as a beautiful environment in which to see many of the brand’s show pieces displayed. For Glyn Peter Machin, the superyacht and private residence realm represents a chance to push the boundaries of art and design to create one-of-a-kind pieces for some of the most sophisticated projects in the world. It is becoming well known that collaborating with Glyn Peter Machin is a chance for clients to indulge and express their fundamental passions in a form that is entirely original.